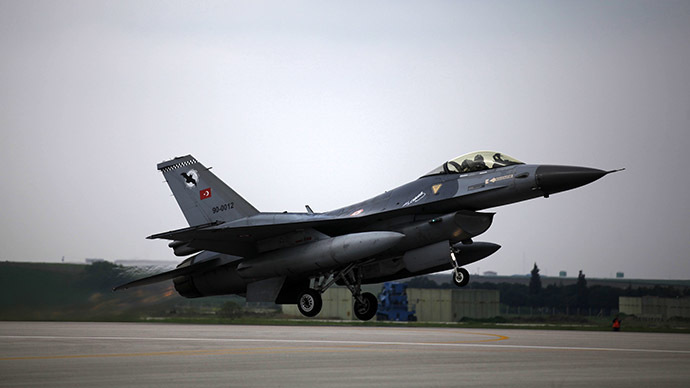 Two Turkish F-16s has shot down Syrian aircraft that allegedly violated Turkey’s airspace in the southern province of Hatay. Syria says the target was a small unmanned surveillance plane, while Turkey claims it was a helicopter. According to Turkey's Defense Minister Ismet Yilmaz, a helicopter went seven miles into Turkish territory, for a period of five minutes, before the two jets fired two missiles into it. Locals reported seeing the aircraft break into several parts, then hitting the ground on the Syrian side of the border. Turkey, which has staunchly opposed the government of Syrian president Bashar Assad since the start of a rebellion against him four years ago, regularly scrambles jets on its 900 km border with Syria. A Turkish F-16 shot down a Syrian MiG-25 in March last year.